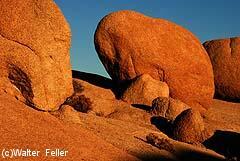 The geologic landscape of Joshua Tree has long fascinated visitors to this desert. 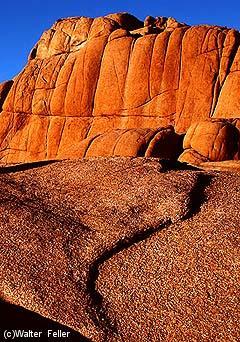 How did the rocks take on such fantastic shapes? What forces sculpted them? Geologists believe the face of our modern landscape was born more than 100 million years ago. Molten liquid, heated by the continuous movement of the Earth's crust oozed upward and cooled while still below the surface. These plutonic intrusions are a granitic rock called monzogranite. The monzogranite developed a system of rectangular joints. One set, oriented roughly horizontally, resulted from the removal, by erosion, of the miles of overlying rock, called gneiss. Another set of joints is oriented vertically, roughly paralleling the contact of the monzogranite with its surrounding rocks. The third set is also vertical, but cuts the second at high vertical angles. The resulting system of joints tended to develop rectangular blocks. Good examples of the joint system may be seen at Jumbo Rocks, Wonderland of Rocks, and Split Rock. As groundwater percolated down through the monzogranite's joint fractures, it began to transform some hard mineral grains along its path into soft clay, while it loosened and freed grains resistant to solution. Rectangular stones slowly weathered to spheres of hard rock surrounded by soft clay containing loose mineral grains. Imagine holding an ice cube under the faucet. The cube rounds away at the corners first, because that is the part most exposed to the force of the water. A similar thing happened here, but over millions of years, on a grand scale, and during a much wetter climate. After the arrival of the arid climate of recent times, flash floods began washing away the protective ground surface. As they were exposed, the huge eroded boulders settled on top of one another, creating those impressive rockpiles we see today. Visitors also wonder about the "broken terrace walls" laced throughout the boulders. 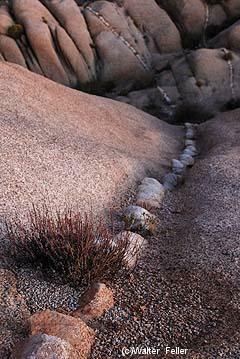 These are naturally occurring formations called dikes or intrusions. Younger than the surrounding monzogranite, intrusions were formed when molten rock was pushed into existing joint fractures. Light-colored intrusions formed as a mixture of quartz and potassium minerals cooled in these tight spaces. Suggesting the work of a stonemason, they broke into uniform blocks when they were exposed to the surface. Of the dynamic processes that erode rock material, water, even in arid environments, is the most important. Wind action is also important, but less so than the action of water. The processes of operating in the conditions of the present are only partially responsible for the sculpting of the rocks. The present landscape is essentially a collection of relic features inherited from earlier times of higher rainfall and lower temperatures. Horizontal and vertical joints in monzogranite formation. Boulders forming have not yet broke free of formation. Quartz intrusion into monzogranite (dike).